Christopher Leonard rules Ravnica after wild finish! The hashtag for Grand Prix Montreal is #GPMontreal. Join the conversation. It was an incredible ending – Sure Strike plus Gravitic Punch for Christopher Leonard Huu Nguyen to take down Michael Van Vaals in the finals of Grand Prix Montreal. It was the perfect ending to a perfect Top 8 for Leonard, who carefully navigated his way through a dangerous Top 8 in which he pulled off multiple come-from-behind victories. Stealing victory from the jaws of defeat is what the Izzet guild does best in Guilds of Ravnica, and Leonard’s run throughout the weekend demonstrated just how explosive the deck can be. Gravitic Punch was the card he named as his MVP in the Sealed portion of the Grand Prix – the first with Guilds of Ravnica – and he may just frame it on his wall after how well it served him in the Top 8. He can put it next to his trophy, a worthy memento of his victory in a tournament that began with more than 1,000 players eager to play with Magic’s newest set. 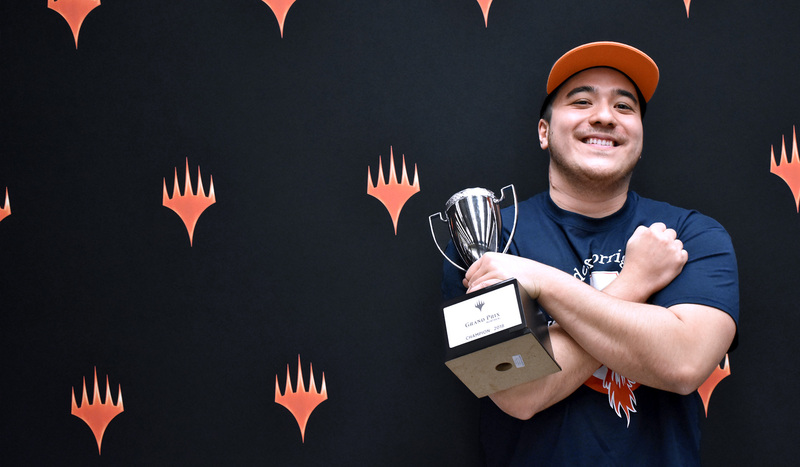 Congrats again to Christopher Leonard Huu Nguyen, the champion of Grand Prix Montreal. From the 1,070 players that started their Guilds of Ravnica adventure in Montreal, 206 pushed through to return for the Sunday spotlight. Four scored a perfect 9-0 match record—Brad Bonin, Chris Ha, Alexandre Cadieux and Alex Watt—to start filling the first Draft pods for tomorrow. Behind our quartet of leaders lurk a bevy of professionals ready to stake a claim on a Grand Prix Trophy. From Ari Lax and Bertrand Joseph-Pare to Rich Hoaen, Oliver Tomajko and Alexander Hayne, two drafts will determine who makes the Top 8 cut Sunday night. All the action from the City of Saints continues starting Sunday morning, live at twitch.tv/magic!